If you are ill, disabled, struggling to find a job, bringing up children, or past working age then you can apply for social security benefits to help you. This safety net is there for all of us if we need it. However, privatisation is threatening your safety net (alongside cuts and bad government policies). Private companies involved in social security cost us too much and make mistakes that have damaged people’s lives. We need to kick these companies out of social security to ensure a safety net that is there for you when you need it the most. Since the 1980s, the government has contracted out many parts of social security to private companies. This means you pay while private companies profit. Between 2012- 2013, central and local governments spent £4.3 billion of your money on the four leading companies involved in social security, despite their major failings. Research shows that private provision may be less efficient in employment services, so why are we still wasting money on privatisation failures? The recent film, ‘I, Daniel Blake’ highlights the importance of social security and the risks when our safety net fails. The profit motive encourages private companies to cut services at the expense of those who desperately need help, which can have disastrous consequences for those in need. If you were dependent on tax credits, who would you trust to give you the fair deal you deserve? A government representative who is ultimately accountable to you? Or someone working for a private, profit-making company who is trying to meet targets, cut costs, and increase company dividends? 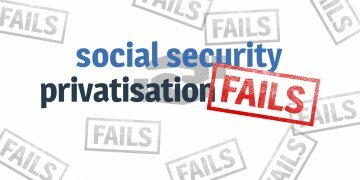 Time and again, privatisation of social security has cost you money and undermined your safety net. In 2013, the government hired the private company Atos to assess disability claimants and reduce costs in the sector. However, after a series or mistakes, the process of repealing incorrect decisions made by Atos cost the taxpayer £60 million overall. Staff at the private recruitment company, Action 4 Employment, fraudulently stole £300,000 of public money in 2015. Private companies are wasting your money. Meanwhile, these companies try to increase their own profit – even if this means abandoning those they are meant to support. A Channel 4 documentary in 2016 revealed that the private company, Capita, had been dismissing disability claimants without even meeting them. The company had been trying to get through claims as quickly as possible to save themselves money. Atos did the same and we wasted £60 million clearing up the mess after incorrect claims. The latest in a long line of privatisation scandals surrounding social security relates to Concentrix, a company used to contract out the provision of tax credits. After handing over £32.5 million of your money to Concentrix since 2014, the government has now cancelled the contract with Concentrix because of massive failings. Due to company mistakes, thousands of people – particularly single mothers – had their tax credits wrongly stopped. In addition, many letters sent out by the company went missing and lots of people had their tax credits taken away without the required 30 days notice. 15,000 people are currently appealing decisions made by Concentrix, which could mean more of our money being used as compensation. The good news is tax credits have now been taken back in house and HMRC has said it will no longer use private contractors to do similar jobs. Photo taken from the film 'I, Daniel Blake' (2016).